Hello lovely peeps....it has been so long since my last post....I won't make excuses, but hope that some of you have stayed around. Yesterday the weather was not too bad in my part of the world considering we are in the beginning of winter....so what is one to do on a Saturday afternoon but offer to take youngest girl driving....she needs to get her hours up before being able to go for her licence. Hmmm...where shall we head to???? I know ....how about The Vintage Shed .... No, there was no ulterior motive and yes, a few gorgeous little goodies were purchased... I'll share at a later date. 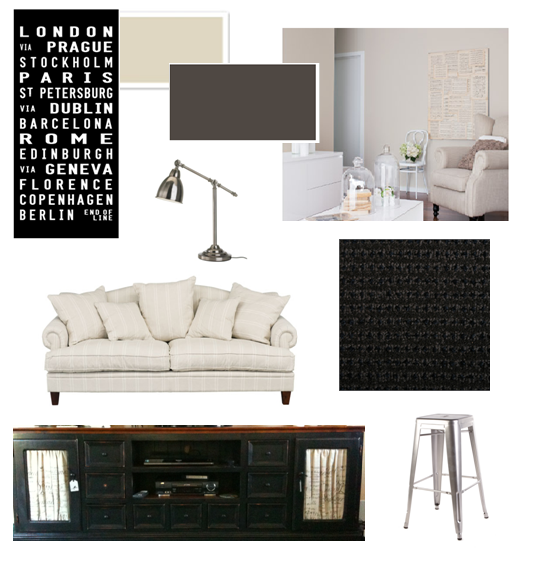 Which leads me to a dilemma I've been having while trying to put together a look for our living/family room area.... I have mentioned previously on this blog the love I have for a bit of industrial, and the difficulty I have had in trying to choose light fittings. Who would have guessed that choosing light fittings would be so hard. Dulux Hog Bristle paint.... couch from Early Settler.....new carpet that is actually much nicer than the sample..... lamp and TV cabinet ...we already have!!! but am worried that they will date quickly.... so I am thinking maybe a simple chandelier??? I know you lovely peeps will have some wonderful ideas...please share any suggestions. Thanks for visiting and hope to pop in and see you soon. I love all your ideas! That sofa is exactly what the sort of thing I've been looking for too. I'm sure that what every you choose it will look stunning! Love your style and the direction you are heading in...I love the industrial pendants too! Thank you lovely ladies for your gorgeous comments....for some reason my reply icons aren't working??? Does anyone have any idea why ??? or is anyone having the same problem ?? ?